With Sedation Dentistry, you have the option to literally sleep through your next dental appointment. We have patients who choose IV Sedation for every appointment—even cleanings. Sedation Dentists will sedate patients with Dental Oral Sedatives or IV administered Sedatives. It’s a fact of life that some people are afraid of going to the Dentist. We know—and we understand. But it’s also the case that skipping those regular visits to the Dentist can cause far greater tooth problems later on. For such patients, Sedation Dentistry is often a great option. 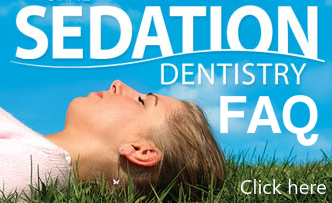 Sedation Dentistry isn’t just for people who are ‘afraid’ of the dentist, however. Many of our patients are busy professionals and parents, and Sedation Dentistry is an increasingly popular option for people who need work done, but who don’t want to chop up their busy schedules. Sedation Dentists say they are able to get four times as much work done, on patients who have been put to sleep, and in half the time. Sedation Dentistry is ideal for patients who have extensive dental needs where several dental procedures normally requiring several dental appointments can be done in one appointment. Sedation Dentistry is also great for severe Dental Anxiety, patients with strong gag reflexes and people who have difficulty getting numb. Yes. In fact, Dentists who are trained in Sedation Dentistry consider IV Sedation to be the safest form of Dentistry. Trained and certified Sedation Dentists are able to monitor a patient’s blood pressure with precision, and are able to adjust medications accordingly. Because of this higher level of control, some doctors recommend Sedation Dentistry for their patients who have high blood pressure or other cardiac issues. No. In the state of Maryland, as in most states, Sedation Dentists must meet stringent criteria mandated by the State’s Board of Dental Examiners. Dentists who wish to perform Sedation Dentistry must first pass a special residency program in which they work closely with anesthesiologists. Does insurance pay for sleep-sedation dentistry? Medical Insurance sometimes covers the cost of IV Sedation Dentistry, regarding it as a surgical procedure. Health insurance typically does not cover the cost of Oral Sedation Dentistry, however. There are two types of Sedation Dentistry: Oral and IV. Oral Sedation is great for patients who desire a lower dose of Dental Sedation. Typically, patients who take oral sedatives will become drowsy, but will stay awake. Your dentist may give you medication to take about an hour before the procedure. IV Dental Sedation is much quicker, as it is administered through a vein. This allows the Sedation Dentist to more completely control the level of Sedation. Patients who choose Sedation Dentistry also typically receive the same local anesthetic they would receive otherwise. Our patients report that being sedated can make a three-hour procedure seem as if it took just five minutes. Most patients will not remember the procedure. With either type of Dental Sedation, we do ask that patients receive a ride to and from their appointment.